I checked on the tiny house this morning to see how the thinset was curing and to make sure that the floor wasn’t too cold. It went down to -16 C (3 F) last night and the thinset needs to be at least 10 C (50 F) to cure properly. The floor seemed to be curing but was still a little cool to the touch so I turned up the heater. The windows and parts of the door were covered in condensation. The condensation on the lock and door handle had frozen. I do indeed need a heat recovery ventilator to for ventilation in the winter. I didn’t have my camera with me to take pictures when I went in at first, so the photographic evidence isn’t quite as spectacular as it was when I first went in. Condensation build up on the lock, door handle and door. A close up of the condensation on the lock. Condensation build up on the window. The whole window was covered in condensation early this morning. Condensation build up on the window and crank. The condensation that built up under the window crank. During this past week, I was puttering around my sheathed tiny house when realized that I had not measured the width of my tiny house. When the ridge beam was put in place, the height of the trailer was discussed – because the plans I bought clearly state that the house be built for the legal road height of 13’6″ (or 4.15m). What it isn’t as clear obvious about is the width of the house. The width of the house is there, but there is no obvious statement such as “make sure your house is no wider than 8’6″ (or 2.6m)“. So I measured the width of my tiny house and it was 8’10” wide. I have not done much research into building my house wider than 8’6″ because I have no desire to have to get a wide load permit, or move my house with a vehicle larger than a heavy-duty pick up truck as that would be a little more complicated than renting a pick up from a car rental company. All this to say, we had to make some cut backs this weekend. All of the rafters had to be cut back. Hanging out on the roof, removing the fascia. The rafters for the dormers already had the fascia installed, so that had to be removed and reinstalled. I am very glad I didn’t have to figure out the math of how much had to be cut off each rafter as they are on an angle, and generally that kind of math makes my brain hurt. Stefan made templates for me to mark off each of the rafters the appropriate amount. He used a reciprocating to cut each rafter. There was an experiment with a chainsaw, to see if it was the better tool. The chainsaw was quickly abandoned, as it was faster, but not as friendly to the sheathing as the reciprocating saw. After the rafters were cut, the fascia was reinstalled and then a section was added to tie the 12/12 sections of the roof together as per the plans (12/12 sections are the sections of roof that are steeper than the dormers). 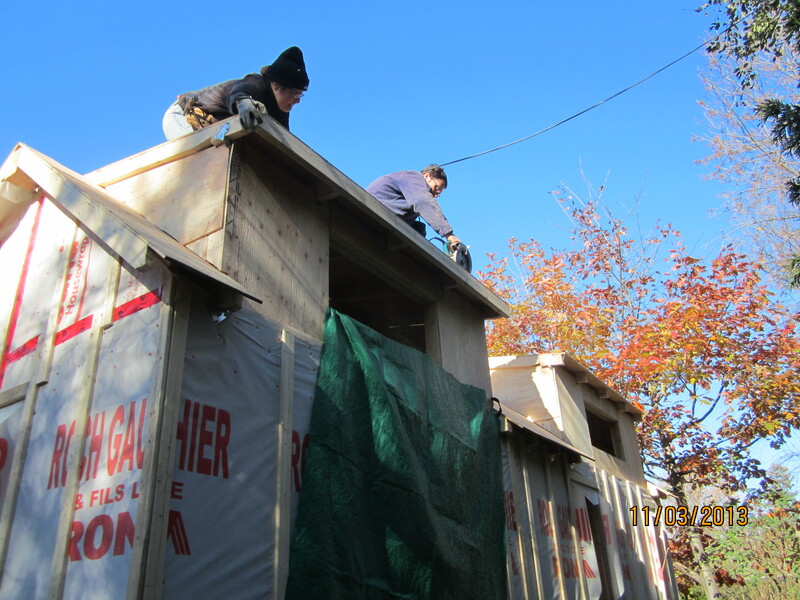 At the same time, we insulated and house wrapped most of the dormers. This weekend was reduced to one day of building due to some fairly solid rain on Saturday. Sunday was a beautiful clear and bright day. It was also cold. When we started in the morning, the ground was frozen. I was showered with small pieces of ice as the tarp was removed. Winter is around the corner.